Did you know they made amaretto cake? I sure didn’t before we had some for christmas. One moment of terror came when I lost my ability to connect to my server back in the apartment. My fears ranged a roommate who killed the power before she left, to break in attempts, to having the electricity cut off, but fortunately it turned out to be an issue with my ISP which they’ve since resolved. This is the first time I’ve had any sort of outage that was the result of the network rather than my equipment, which makes Time Warner, Qwest and Comcast all look pretty shabby by comparison. Thought some might be interested in this article in The Economist on the growing prevalence of chili peppers in European and American food. TASTELESS, colourless, odourless and painful, pure capsaicin is a curious substance. It does no lasting damage, but the body’s natural response to even a modest dose (such as that found in a chili pepper) is self-defence: sweat pours, the pulse quickens, the tongue flinches, tears may roll. But then something else kicks in: pain relief. The bloodstream floods with endorphins—the closest thing to morphine that the body produces. I should have waited before I posted the previous xkcd, while fun, it can not compare to the total awesomeness that is the cuttlefish! 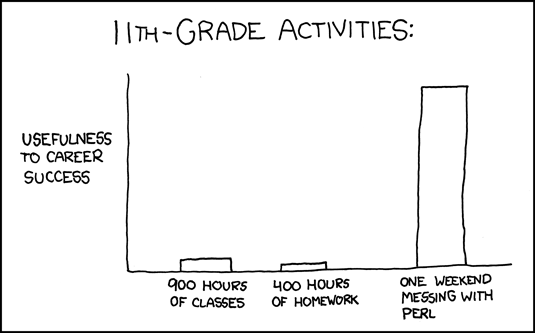 Unfortunately for me I didn’t start messing with Perl until four years later (my junior year of college). Now I have a sleeping bag which is wonderfully warm, and which I’ve owned since elementary school. Between my amazing sleeping bag, my pre-existing comforter, my sweatpants over pajama pants, plaid shirt over t-shirt, stocking cap over Iowa State Agronomy Club hat, and my delightfully warm corn socks, I may look ridiculous but I anticipate I’ll get a relaxing night’s sleep. 1:34 Home safe and sound from my 28 hour work day. Now I just want to do some laundry, eat a frozen pizza and catch up on the daily show. 8:10 I managed to get through most of the night without resorting to caffeine but now I’m leaning heavily on my mints to make it through the finals stretch of daytime. In four more hours my sampling will be complete. 12:11 AM – Officially Friday. My routine is simple. Get liquid nitrogen. Harvest tissue in the dark using green flashlight. Store tissue in -80 C freezer. Watch a couple of stargate episodes. Repeat. 9:21 – Check out my phylogenetic tree! The red genes are arabidopsis, the green is corn, the yellow is rice, and the black ones are the new genes I’ve been finding in brachy tonight. These genes are involved in regulating flowering and, while they were first discovered in arabidopsis, as you can see the story is a LOT more complicated in grasses like corn and rice. 8:02 – Just collected my second set of samples. 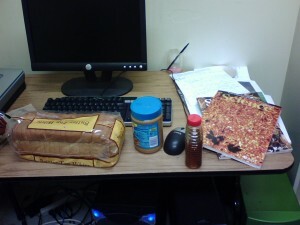 I’m now four hours and three tasty and nutritious honey and peanut butter sandwiches into the sampling run. 6:45 – I’m alone in the lab now. Working on building a gene tree so I’ll have something graphical to show for all my work today. The qPCR machine is busy until 7:30, but I’m considering putting a second set of reactions in. After all, I’ve got all night. 4:11 – Well the qPCR results show no circadian changes in gene expression. The numbers are so similar for all three genes that I think the reactions might now have worked after all. I’ve spent most of the past four hours locating brachy genes. Sequence analysis, especially when you can listen to music, is one of the most fun/relaxing things I’ve ever gotten paid to do. Too bad one of these days a budding young computation biologist will write a program that does a better job of predicting genes than a human sitting at a keyboard. It’s already close. 12:33 – Well the qPCR reaction at least produced data, which puts me ahead of the other rotation student who used it this week. Whether it’s good data remains to be seen, analysis is going to take a while. In case anyone is interested by what I meant by annotating brachy genes, here’s a screenshot. The brachypodium genome is currently in draft format, which means, among other things, there are no good gene models. Since we need to look at genes from brachy to compare to my work in maize I need to find those genes, and pull them out of the genomic sequence. 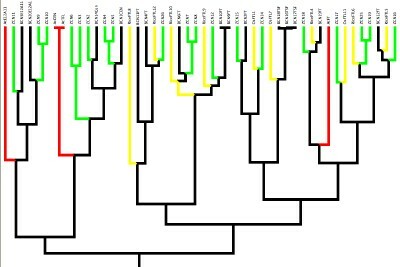 The top orange bars show computationally predicted genes, the middle grey ones are areas that look sort of like known genes in other species, and the bottom colored areas show BLAST hits that I found using by searching the whole brachy genome with for sequences that look like the genes I’m studying. Peanutbutter and honey sandwiches. The poor grad student’s powerbar. Ok, back to work now. Just today I wrote about building a computer to run BLAST for my whole lab essentially for free (once the lab orders a new graphics card, and I can put mine back in my computer at home, it will have cost a total of $40). There was no piracy involved, all the software running on that computer, specifically the operating system, the web server, and wwwblast, has been made available free of charge. When you can build a computer for $150, buying even the home version of windows adds 60% ($90) to the cost of your computer. The desktop version of Ubuntu, a kind of linux, provides almost all the, non-gaming, functionality anyone expects from their home windows computer (going up against apple is another matter), doesn’t get viruses, runs fast on cheap or old hardware, and almost never crashes. For free. “…observed one of my students with a group of other children gathered around his laptop. Upon looking at his computer, I saw he was giving a demonstration of some sort. The student was showing the ability of the laptop and handing out Linux disks. After confiscating the disks I called a confrence with the student and that is how I came to discover you and your organization. Mr. Starks, I am sure you strongly believe in what you are doing but I cannot either support your efforts or allow them to happen in my classroom. At this point, I am not sure what you are doing is legal. No software is free and spreading that misconception is harmful. These children look up to adults for guidance and discipline. I will research this as time allows and I want to assure you, if you are doing anything illegal, I will pursue charges as the law allows. Mr. Starks, I along with many others tried Linux during college and I assure you, the claims you make are grossly over-stated and hinge on falsehoods. I admire your attempts in getting computers in the hands of disadvantaged people but putting linux on these machines is holding our kids back. The recipient of this e-mail makes a remarkably calm and rational rebuttal here. I’d add only that the argument she makes about all computers running windows would apply equally to giving children apple computers as to giving them linux ones. Speaking from personal experience, running Linux for any length of time is going to spark the development of high level computer skills. Unlike the strong line between a computer programmer and a computer user in windows, Linux has a gradual transition where each new piece of knowledge proves immediately useful to user. If even one of those kids could have grown up to be a programmer or a computational biologist or an IT guy and instead ends up flipping burgers for a living, that child’s suffering is on her head. Visited a delicious burger restaurant in Berkeley today after class. They server beef, veggie, chicken and turkey burgers… to which my reaction was “No pork?” Seriously though it was very tasty, I was pleasant surprised. Life is still really busy. I went in both days of this weekend to keep running reactions. I’ve also set up a local blast server for the lab. * I got to build the computer from left over parts from two computers that another grad student had inherited when a friend upgraded his LAN gaming set up. 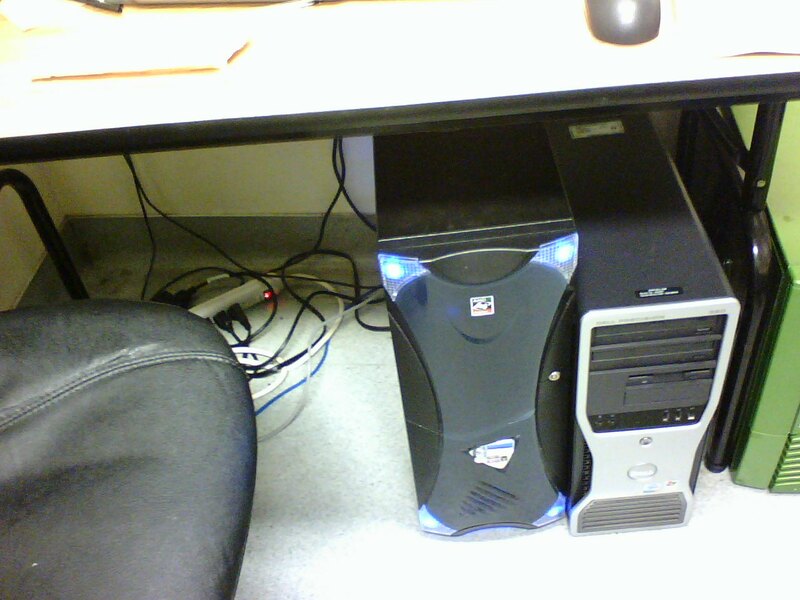 So the new lab blast server lives in a giant gaming case, with clear plastic sides and glowing blue lights. After mixing and matching pieces it was just a matter of installing Ubuntu, setting up the webserver and blast server programs, and installing databases like the brachypodium and maize genomes. I’ve been accumulating this skill set for two and a half years, since Monty first showed me how to build a desktop computer and I got a summer job that got be started using the command line a perl scripts. It was really fun to put all the pieces together and go from two broken computers and an internet connection to a functioning piece of equipment of measurable benefit for the whole lab. *Some context, BLAST is a program used to search for other genes related to the one you’re interested in, which can help apply knowledge gained from studying one organism to others. Along with PCR probably the most universal mainstays of a modern molecular biology lab.